The search for a violinist has been long and fierce, and as the winner emerged one Nona. Welcome to the company! There will be two more shows in Tampere this summer, in O’Hara’s Freehouse on September 4th and Pub Kujakolli on September 12th. The latter will also mark Nona’s first appearance on stage with us. Greenrose Faire took the first place in a talent show called “Hyvän Mielen Esiintyjä 2009” in Tallipiha, Tampere on Sunday. Despite the cold weather, there were plenty of people and over two hundred votes cast in the competition between a dozen performances ranging from music and dance to theater. Additionally, our gig calendar now features a handful of further gigs in Tampere region in August/September. After yesterday’s practise, we visited the acoustic jam session at a local rock bar Amadeus. 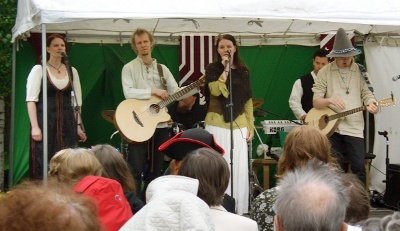 The first semi-public appearance with a new ensemble is always a bit nerve-wrecking, and there was barely room for the six of us in the band corner, but the performance was well received even thought the crowd was there mainly to hear “Sweet Home Alabama” or an acoustic rendition of “Epic”. But when we were playing the second-to-last song of the night and even the bouncer… well.. bouncing up and down and grinning, I knew we were doing something right. A great night. 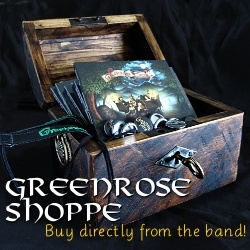 Greenrose Faire a medieval influenced rock/pop/folk band from Tampere, Finland.